All About Real Estate Auctions: How many price reductions does it take? How many price reductions does it take? The most common way to sell real estate in the U.S. is by listing it in MLS and then, if it doesn't get any interest, begin to drop the price until a buyer makes an acceptable offer (see above). 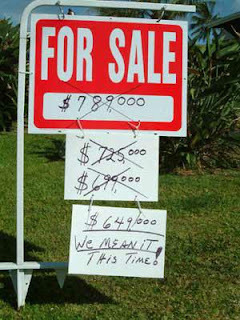 Most real estate agents don't realize that this method of selling is actually a type of auction. It's called a dutch auction, just done very slowly. By definition in Wikipedia, a Dutch auction is a type of auction where the auctioneer begins with a high asking price which is lowered until some participant is willing to accept the auctioneer's price. So, since real estate agents are already using one type of auction, why not try a more traditional auction? An auction where you open bidding to a group of interested buyers and let them compete against each other to determine the market value. It can be done much faster and is a much more exciting way to sell real estate. The traditional auction puts you in control. You determine when the property is open for viewing, you control when the bidding will end and the seller decides whether they will accept the highest bid. With the glut of inventory available in many markets, auctions are gaining momentum and by using the internet, you don't need to coordinate a "live" event, all the bidding can be done online. Not sure how you can do it in your market? Join us Thursday for our next online auction training session.